You are here: Home / Bath Mats / What is a Fleece Blanket? Do you want to know what’s a fleece blanket? In fact, the fleece is different from wool, although it gets this name from the ‘fleece’ coat found on sheep, fleece refers to a kind of manmade knitted fabric. What are fleece blankets made of? Fleece blankets are usually made of Polyester. 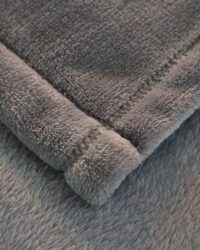 Polyester fleece is a fuzzy, soft fabric often used for throw blankets, sweaters, jackets, mittens, hats, and other applications where a warm material is needed. It was popular for outdoor gear in the early 1990s since people found it warmer and lighter weight than wool. Then Polyester fleece became more and more popular and has found more specialized uses. Until now, Polyester fleece has been a very important fabric in the world and has used to make astronauts’ underwear and in deep-sea diving suits. Flannel blanket: Flannel blanket is made from flannel fleece that is a type of fabric made from polyester. They are anti-fade, fade resistant, anti-pilling, wrinkle-free, and no shedding. Further, they have great elasticity to keep their shape for long and can stain better than others like the cotton blanket. Polar fleece blanket: Blanket made from Polar fleece. 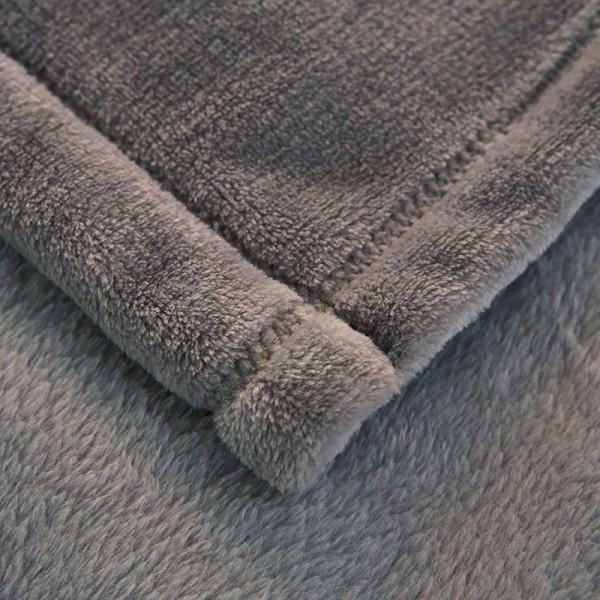 Polar fleece is a soft napped insulating fabric made from Polyester. Its biggest feature is hydrophobic and will hold less than 1% of its weight in water. Even in a quite wet situation, it can retain much of its insulating quality. Moreover, It is machine washable and can dry quickly. Sherpa fleece blanket: These blankets are made from Sherpa fleece whose raw material is polyester. It is a variant of stretch knit polyester fleece fabric. Sherpa fleece has two distinct sides, so the sherpa blankets have a smooth knit side and a side with the texture that looks like a real sheep’s fleece. Coral fleece blanket: The coral fleece blanket is similar to the polar fleece blanket, but coral fleece is thicker and has a higher “pile” than the polar blanket. It is very necessary to finish the edges of coral fleece since the coral fleece sheds on the edges due to its furry texture and it tends to have more stretch than other fleece fabric. Soft and warm: Made from fleece fabric, the blankets are soft enough, and they can keep us warm in cold weather since they can absorb the heat of us well to keep our body’s heat closer to us and let heat dissipate more slowly. Lightweight: Fleece blanket is light since the fleece weighs lighter than wool. So fleece blankets are perfect for year-round warmth and comfort. Hypoallergenic: There are some people are allergic or sensitive to wool, so the fleece will be a perfect alternative when these people need a blanket that is soft and warm enough. More competitive price: The fleece blankets have a very competitive price compared to wool blankets since the wool is so expensive. When you need throw blankets used on sofa, travel, and car, a cheaper fleece blanket is enough and they can also offer you the ideal warm and soft. When you need bulk blankets to advertise your company or brand, it will be wiser to choose the fleece blankets. Easy care: Fleece blankets are machine washable and don’t shrink. Recommended washing method: Machine washes blankets with cold water separately on gentle/delicate cycle. Tumble dry on low heat. Don’t bleach. Wide usages: Home, travel, hotel, promotions, advertising, souvenirs, sofa, camping, gift. Durable, ecologically friendly, and quick drying. Use some dishwashing liquid to pre-treat the stains if you want. This makes it easy for you to soak the stain and remove some of it naturally. Blotting away as much as you can is going to help a lot. Make sure that you always use a paper towel to lift the stain. Be careful not to rub the stain too much, as you will make things worse and that’s the type of thing that you want to avoid. You can wash the fleece throw blanket by hand or wash it in the washing machine. But how to wash fleece blanket in the washing machine? Ok, you can wash the fleece items together as you combine similar colors. You want to use warm water on fleece, and this will help a lot, but do avoid using any kind of bleach, as it will be a very good investment for you to keep in mind. Fabric softeners sound good, but they are not as good as you might think for your fleece blanket. In this case, you want to dry the blanket at a gentle cycle, and you don’t want to use a lot of heat either. The fleece blanket is known for being very sensitive, and the last thing you want is to deal with any kind of problem in that perspective. Once the drying process is complete, remove them immediately if you can. In case the blanket is very fluffy, put it on a flat surface and then you have to press it with your hands. The results can be great here, and if you can hang your blanket outdoors and dry, that will offer you a fresh smell. When it comes to storing your fleece throw blanket, you want to fold the blanket properly, and then you can add a scented dryer sheet inside the fold. This makes it easy to keep the blanket fresh, and it will retain that sense of amazing quality that you need in such a situation. Just try to consider all of that when you wash and dry the fleece throw blanket. In conclusion, the fleece blanket is not that hard to wash. Keeping it clean can be a great experience, and it can bring in front some rewarding results no matter the situation. It’s always a good idea to push the boundaries as you adjust and adapt all this kind of stuff. It’s important to take your time and handle the fleece blanket maintenance the best way that you can. The better care you take of your fleece blanket, the more it will last! https://zjmanew.com/wp-content/uploads/2018/08/polar-fleece-blanket-e1536824565749.jpg 567 500 June https://zjmanew.com/wp-content/uploads/2018/09/logo-2.jpg June2018-07-10 02:03:362019-01-01 13:35:53What is a Fleece Blanket? ZengBo, focused on the fleece blanket, Polyester shower curtains, and floor mats since 2007. The main products include polar fleece blankets, flannel blanket, sherpa blankets, polyester shower curtain, and custom door mats.